In 1986, there were few games that could compete with Dungeons & Dragons for a share of the Fantasy themed role playing game marketplace. Other than a few successful (but niche) games like Runequest and Dragonquest, most Fantasy themed rpgs were pretty much D&D rip-offs. 1986 was the year that all changed. 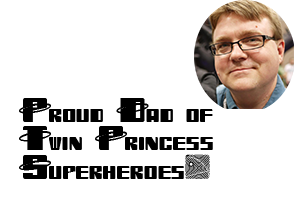 Steve Jackson released GURPS and Games Workshop -- a giant in the fantasy miniature wargaming field -- released Warhammer Fantasy Roleplay. Warhammer Fantasy Roleplay (WFRP) had the subtitle "A Grim World of Perilous Adventure," which turned out to be something of a vast understatement. 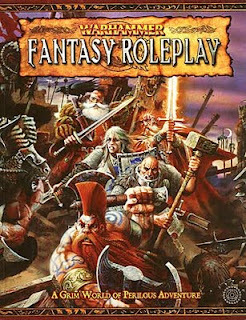 Where other games tried to compete with D&D by giving the characters played by gamers more powers in a familiar system, WFRP made the characters more human. In AD&D, there are points in character advancement (an rpg term describing how characters acquire new spells and combat efficiency as they gain "experience") when the threat of character death lessens. This is never the case in WFRP. D&D is a game of kicking down doors and killing orcs. WFRP was a game of giving a second thought to being anywhere near the door. "Can't we just get the city guard to go instead," is a phrase frequently uttered by WFRP characters. WFRP's mechanics helpt to create narrative tension by having high levels of character vulnerability. Add to the narrative tension and easy to learn system based on, but very different from, the system used in the Warhammer Fantasy miniatures game and you had a game destined to find an audience. When looking at the 1st edition Warhammer Fantasy miniatures rules one could still see reflections of TSR's Chainmail miniatures game. In fact, were it not for knowing how to play Warhammer I probably still wouldn't understand how to play Chainmail. By the time those systems were extrapolated to create WFRP, there is almost no relation to any form of D&D. Where D&D was chart heavy and had little granularity when it came to the skills characters possessed as unique individuals (only Thieves have any skills worth mentioning in early D&D), WFRP had a task resolution system based directly on the capabilities of the characters and the skills they possessed. WFRP was cutting edge game design at the time -- it includes design elements influenced by Traveller among other games -- and added some elements that still influence modern game design. 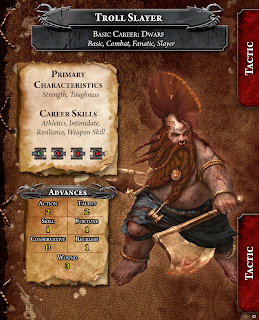 Some WFRP skills can only be described as "proto-feats" given the way they influence play. 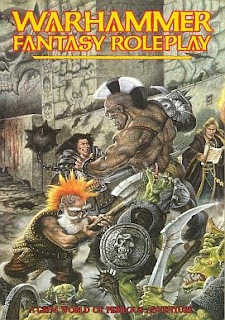 WFRP was a breath of fresh air, but it didn't stay in the limelight long and seemed to wither for a while. Then in 1995, James Wallis' Hogshead Publishing re-released the game for a new audience and reprinted some of the more difficult to find books for those of us who loved the game but had lacked well stocked game stores in the 80s. It should be noted that one of Wallis' current projects is an equally valuable reprinting of the wonderful Dragon Warriors rpg through his Magnum Opus Press. But the Hogshead renaissance was too short lived and as the rpg market became overwhelmed with D&D fever in the wake of D&D 3rd edition in 2000, WFRP fans were left wondering if they would be left out in the cold. That wonder was answered in 2005 when Green Ronin, under license from Games Workshop, designed and released Warhammer Fantasy Roleplay 2nd Edition. The game remained close in design to the original rpg, but added some new design elements and tried to clean up some ambiguities. It was also a marvel to look at. Green Ronin's revitalization of WFRP contained the great strength of being largely compatible with the previous editions, but it also suffered from one major weakness. That weakness? That the game was largely compatible with the previous editions. This meant that the game, while easy to learn for an rpg veteran, isn't new gamer friendly. While the books are beautiful in art and layout, there was no "basic set" boxed edition targeted at the new gamer. WFRP 2e was targeted and marketed at an existing market -- those who love WFRP. This is too bad because while the list of "those who love WFRP" has been relatively stable over time, the list of "those who love Warhammer related products" had grown significantly. This was in no small part because Games Workshop had worked very hard to make the Warhammer Miniatures games (both Fantasy and 40k -- their SF game) easier to learn and quicker to play. Warhammer Fantasy Miniatures and Warhammer 40k hit their "mechanical arcane density peak" in the late 80s with the release of the Realms of Chaos books. After a complex edition of miniatures rules, comprised of several dense volumes of rules, Games Workshop began to make their rules clearer and quicker to appeal to new gamers. They also made the games more modular and began a release cycle patter of "Core rules, Army Lists, Campaign Settings, Spin Off Tactical Game, New Edition with new sculpted minis." The system has worked very well and while Wargamers grumble about the cost and edition creep of Warhammer, it has become so constant as to be a hobby in itself and not a real uptick in anger. Quicker, cleaner, easier, the tabletop wargame had that philosophy, but the rpg didn't. At least it didn't until last week. 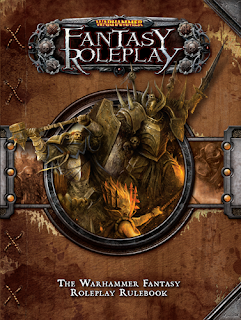 Fantasy Flight Games, the current holders of the WFRP license, have announced a new edition of the WFRP game. As it is only four years since the triumphant return of the game in a new edition, the new release had more than its share of disgruntled detractors. Add to the short time frame between editions that a) WFRP gamers tend to favor a particular style of "old school" gameplay, b) the general environment of new edition anger permeating the internet due to other games new editions, and c) the high cost of an introductory box set, and one can see why there has been a little bit of an internet hubbub about this game. But the game does need a new edition that appeals to a larger audience, if the game wants to expand the rpg marketplace and not merely peel off another segment. 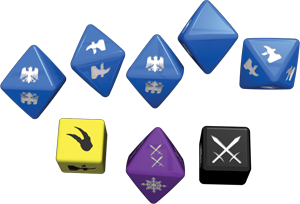 Looking at the components below, I think this might be the game to do it. It uses self explanatory dice, character cards, and comes in a boxed set. These are things that made Heroquest, Heroscape, and Runebound popular games. 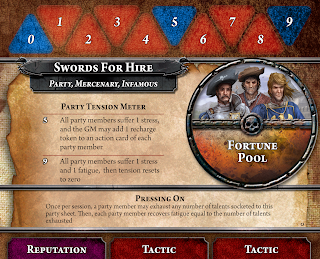 If you add to all the pretty bits an engaging, clear, and quick to play rules set that has some depth with regard to rounding out character concepts you might just have a game that can bring some new gamers into the hobby. Oh, and if the rules are good enough, you may just be able to win over many of those who love WFRP already. Time will tell, but I am excited. this is probably the most even handed article I have read about the whole situation.